It's a process of producing a compact form of serialized object for performance improvement which results in faster network trips. As name illustrates, compact serialized file is compact in form of data and process. 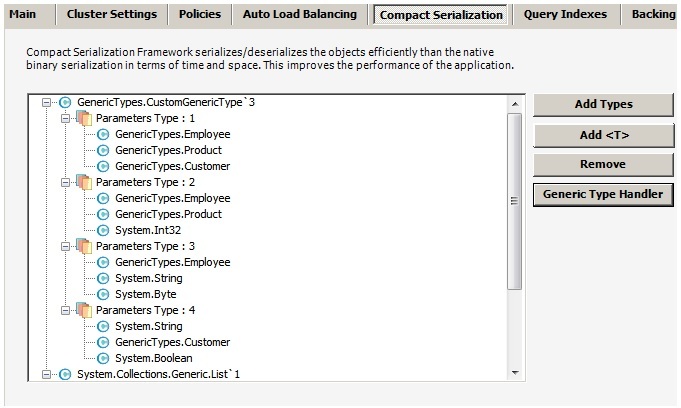 The idea behind compact serialization is that every 'known type' (a known type is a type that is registered with the framework) is assigned a unique 2-bytes type handle by the framework, which lets the deserializer uniquely identify the 'known types'. For using Compact Serialization, you need to define a default public constructor (parameter less) in a compact serializable type and register that type with NCache Manager. NCache now supports Custom Generic Types. All generic types with any number of arguments can be serialized through compact serialization. If a client doesn't want to add generic types and its parameters though UI, then he has the option to add them through IGenericTypes class. To use Compact Serializable types with NCache Configure Cache with NCache Manager and then register your compact serializable types with NCache. Stop the cache if it is running. 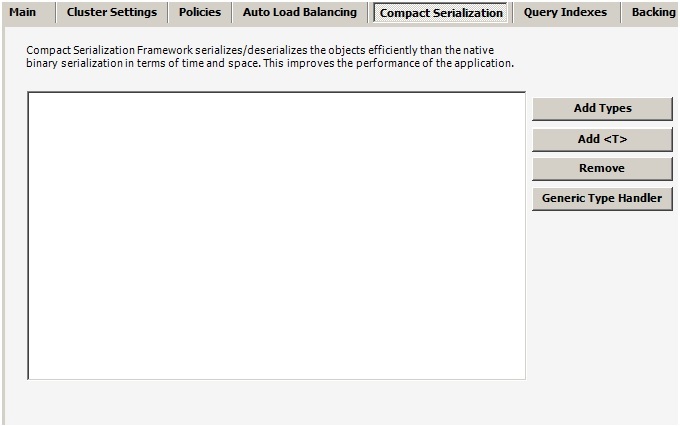 Click on the 'Compact Serialization' tab which will open up the following screen. Click 'Add Types' button. 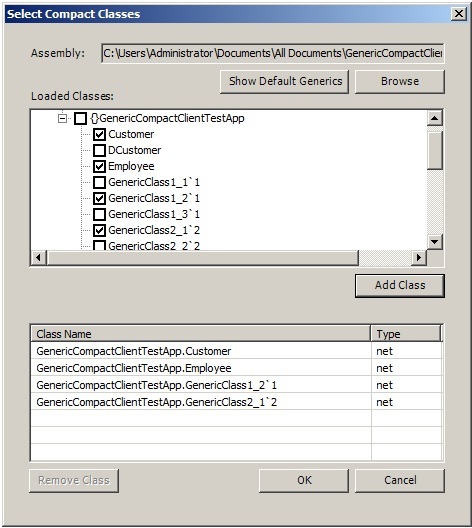 A 'Select Compact Classes' dialog will appear. Browse for the assembly file that contains the compact types by clicking the 'Browse' button as shown in the figure. 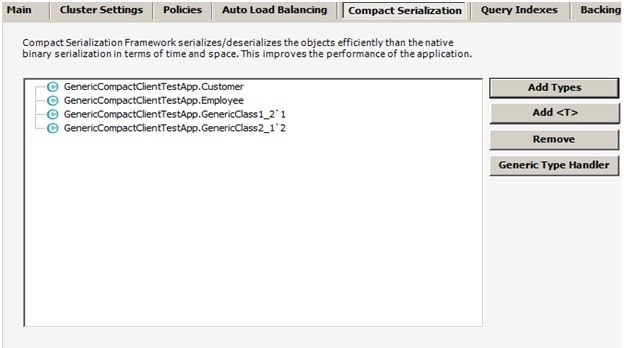 Select the classes you want to register with the cache from the loaded classes list. Press 'Add Class' button to add the classes in the selected classes list. Newly added types will start appearing in the list box under the 'Compact Serialization' tab having Compact Type and Platform information. 'Remove' button will delete the selected type from the registered types list. This shows all the added types. Now arguments can be added with generic types by selecting specific type and then clicking on 'Add <T>' button. This is the other way for registering generic compact types through "Generic Type Handler". With Generic Type Handler user can add all the Generic types at once by implementing our interface. This saves time and effort. Here is a sample code for this. For registering types follow these steps. Click 'Generic Type Handler' button. A 'Select Compact Classes' dialog box will appear. Browse for the assembly file that implements this interface and contains compact types by clicking the 'Browse' button as shown in the figure. Click 'OK' button. All the added types will be listed as shown below.